NONE MORE PRO | The Muddying of “Pro-Life” in the Abortion Debate Debacle. ince when is the opposite of Pro-Choice “Pro-Life”? Correct me if I’m wrong, but isn’t the opposite of Pro-Choice “ANTI”-Choice? Such is the underhanded misnomered word game the extremist villagers who call themselves the American Republican Party have played since the landmark decision Roe v. Wade made abortion legal in the United States in 1973. And everyone else has played right into their hands! You see, when you call yourself Pro-Life you imply any contrary stance is Pro-DEATH. We are ALL Pro-Life. Pro-Life is the condition of the human species, and every single species that has ever existed on Earth. For the very fact we are alive, we can’t BE any more Pro. The correct term for a party that wants to deny choice is, of course, ANTI-CHOICE. To be absolutely clear: The gaslighters who call themselves “Pro-life” are actually ANTI-CHOICE. For various reasons, they can’t bear to afford other people the respect or dignity of choice. They want the government to intrude upon people’s decisions to birth or abort, while in the same breath calling for smaller government. They want the government to intrude on decisions of birth or abort even though it has been secured by law in the United States that it is each person’s right to make that decision themselves. 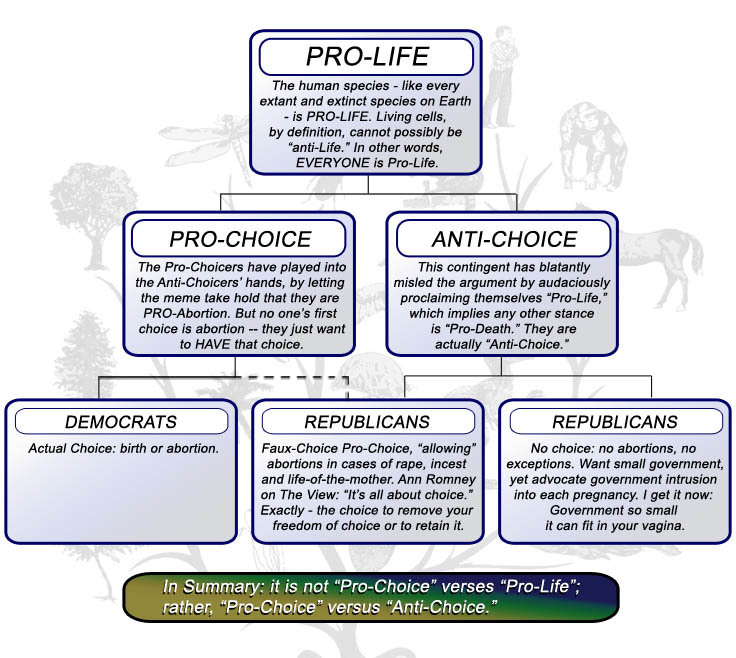 I’m not here to argue the morality of Pro-Choice or the venality of Anti-Choice – I’m just sick to death of duplicitous scum calling themselves Pro-Life when they are actually Anti-Choice; “pro-life” implying everyone else is a crazy-eyed killer of children. For brevity and educational purposes – consult the chart below. Anti-Choice advocates have muddied the waters of the Abortion debate – by calling themselves Pro-Life. And everyone else has been sucked into playing the word game by their rules. — by Jon Dunmore © 22 Nov 2012. Read about what caused all the fuss. Whether you consider yourself moral, Democratic, Republican or pregnant, there’s no denying the grammar behind “choice” and its opposite.